The Thermo Flammable Materials Refrigerator/Freezer Combo offers a multipurpose storage solution for flammable materials that’s completely insulated from the chance of sparking. This Thermo Lab Refrigerator is full height, with two compartments, each with a spark free interior and efficient, adjustable storage. The freezer compartment is 2.4 cu ft, and the refrigerator section is 8.6 cu ft, in a compact footprint. This lab refrigerator freezer has an external thermostat for safety and gives you a temperature range of –1 to 8°C (30 to 46°F) in the refrigerator and –20 to –12°C (–4 to –10°F) in the freezer. The Thermo Flammable Materials Refrigerator/Freezer Combo has CFC free refrigerant and insulation, and requires manual defrost. 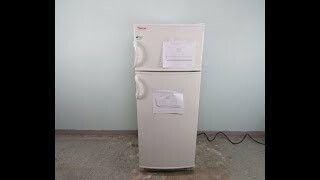 This Thermo Flammable Materials Refrigerator/Freezer Combo CAT# 3551-10 has been fully inspected and comes with validations reports for each compartment. All of our lab equipment comes backed with our standard warranty. Should you have any questions or need help finding the right lab freezer or refrigerator, please don't hesitate to contact us.